Just in case you’re planning your own visit, please note that the acts in the sizzle reel may be different from the acts you will see. We saw some of the same acts, and some different ones as well. As it turns out, my first impression of Cirque Dreams was true to their style. There is always a lot going on at any one time, and much of it is surreal. It has neither the simplicity of more traditional circuses, nor the quiet sophistication of other nouveau troupes. Cirque Dreams Holidaze is very much what you might imagine you would dream if you were a circus clown who drank too much spiked egg nog. There were jump-roping reindeer, a penguin doing rolla bolla, and a marionette who seemed unnaturally flexible. As all of this was going on, gingerbread men toddled across the stage, glittery singers belted out a range of familiar and new holiday tunes, candy canes inched past, and a jaunty woman in red bounced back and forth. It was dazzling and overwhelming all at once. So, is it a good show for kids? Yep. The two young ladies who were with me were absolutely captivated and delighted. Of course, my daughter is always on the look out for the occasional circus trick she has done herself, but her friend equally enjoyed her outside point of view. They both loved the quick-change costume act and I admit that even though I have a decent idea how it’s done, I’m always still impressed. They both giggled through the “Symphony of the Bells” act, which involved some audience participation from some guests in the orchestra. And, of course, all of the aerial acts brought plenty of oohs and ahhs. Cirque Dreams Holidaze has been touring for 8 years and features 30 artists in 20 different acts. If you love traditional circus artistry, there’s plenty to be found in the show. Unfortunately, it’s difficult to concentrate on it with so many other things happening on stage. I occasionally felt bad for the performers that they weren’t able to have our full attention. All in all, it’s a strange, mesmerizing, dizzying holiday circus, but certainly a fun experience for a family. 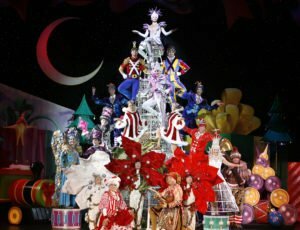 Tickets for Cirque Dreams Holidaze start at $43 and go up to $103 (including a $4 facility fee). You can purchase tickets at the Boch Center Box Office, Bochcenter.org, or by calling (866) 348-9738. *The show is 2 hours with a 20 minute intermission. Disclosure: We received complimentary tickets for review purposes. No additional compensation was provided.